Diana, Princess of Wales (Diana Frances Mountbatten-Windsor, née Spencer) (1 July 1961–31 August 1997) was the first wife of Prince Charles. 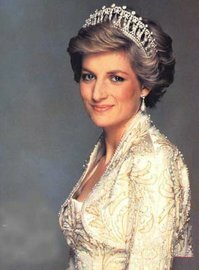 From Diana, Princess of Wales marriage in 1981 to her divorce in 1996 she was officially Her Royal Highness The Princess of Wales, and after her divorce in 1996, Diana, Princess of Wales. She was sometimes referred to as Princess Diana, but this was never an official title and was in fact incorrect, as it can only be used as a princess by birthright rather than marriage. Lady Diana Frances Spencer was 20 when she married Prince Charles, on 29 July 1981. Diana's beauty made her a public icon, and her personal life became frequent fodder for tabloid press. She and Charles had two sons, William (b. 1982) and Harry (b. 1984), but the marriage was troubled almost from the start. Diana and Charles were divorced in 1996 and Diana devoted her life to her two sons and to worldwide charities. The Princess was the first Englishwoman to marry an heir to the throne for 300 years (the last being Lady Anne Hyde who married the future James II). Generally heirs to the British throne were married off to European Princesses. She repeatedly used the mass media to relay her agenda. However, like many before her who have supped with the devil, she found out that she couldn't turn the media on and off as she wanted. Everything she did was fair game for the press. She had of her own volition made her private life public,and she soon discovered she could not keep anything private. Even after her death, however, the Princess's work lives on in the form of commemorative charities and projects set up to help those in need. Although these have not been without their infighting.